This picture is a view of how I mount the windows. It took me awhile to figure this out, but it is one of the reasons I got into this business, and now it takes me an afternoon instead of 2 days to put a window in a car door. This is about my 3rd effort to put windows in a made-from-scratch-door. I tried to do it the way the other guy did it, but I wanted it to be simple and fast, and serviceable. My doors can be stripped all the way down to paint, and can be adjusted for good window travel and alignment. As we progress in building a better car, the things I have learned to do better, I pass along. When I started to become a mechanic, in the early 70's, muscle cars were everywhere, duel carbs, duel points, Bias ply tires. MOST folks could do SOME work on their cars. It's a car not a radio, it should be a simple to work on. I am striving to get these cars to that spot, as a consequence, they are simpler, but I am always improving. We receive the most questions on the following items. Here are our ideas, but remember - Street Rodding is a very personal hobby. Others may have better or different ideas on the same subject. I prefer to use all brand new components, some folks want to use used ones or parts off of a doner car, and some of the other builders do this. While used parts are fine if they are good serviceable parts, but they may need more work to rebuild or make serviceable. All my components are new. 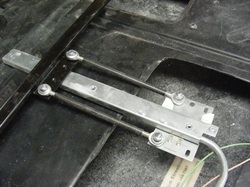 Steering Columns: The GM tilt column is the basis for the new tilt column I use. Standard GM turn signal switches and steering wheels fit. I also use a straight column from Speedway, for that nostalgia look. It has a quick disconnect to remove the wheel with the fast removal of a pit pin. Just like the racers use. Common drop, and lower mounts, along with needle bearing u-joints are used to connect to the steering box. Paint and prep: I fix all the seams and as many pinholes/voids as I can find, making it easier for your paint guy. I have had good feedback on this from body men. The molding process of any fiberglass part requires a mold release agent and the wax used is still on the body, somewhat. A good wax and grease remover wash is a good idea, but the whole body needs sanded for paint to stick. No matter how smooth it looks, paint will not stick to glassy smooth gelcoat. It is too hard and not rough enough for the paint to bite. It is not a bad idea for the body to set in the sun, ON THE FRAME, to cure a bit more. A couple of days should do it. It IS cured, but still a bit fresh from the shop here. Wheel and tire combos: 185/60 14 to 205/60 14 is a good front size and 235/70 15 to 235/75 15 for a rear size with fenders. Smaller on front and bigger on the rear is a good look and is pretty common, and I have gotten 10' of rubber under a rear fender, but if no fenders are used, the sky is the limit. We can tub to get bigger under the fender or just to make the monster rubber fit under the car better. If more is better, talk to me, we have done it before. Rear end: We use a 9" rear end from John's 9" Factory. As a part of the rolling chassis, it will come complete with an open 3rd member. If you need or want posi, I have 2 options, up to 450 HP or up to 750HP. After that, you need a spool. Heavy duty axles are lifetime guaranteed and all housings are new, not reman, and have the big Torino bearings on the end. Powertrain: Small block Chev and Ford are the most popular choices. LS motors are becoming more requested, just finishing up an old Hemi, what a beast! If you want to put something different in your car, ask. Its your car, have it the way you want. Clutches, not a problem. Drive-shaft, Wiring, A/C, Lowering, Prostreet: Like I have said before, get it the way you want, I am a Vintage Air dealer, I can have a driveshaft made, get it low, get it fat, traditional or modern, just ask.